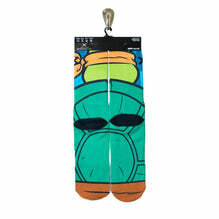 The team's bad boy, Raphael is physically very strong, has an aggressive nature, and seldom hesitates to throw the first punch.His stern attitude made it a right fit to make these crew socks. His personality can be fierce and sarcastic, and oftentimes delivers deadpan humor. He is intensely loyal to his brothers and sensei.